This is a beautiful but wrenching story about family and about truth and about beasts and monsters. 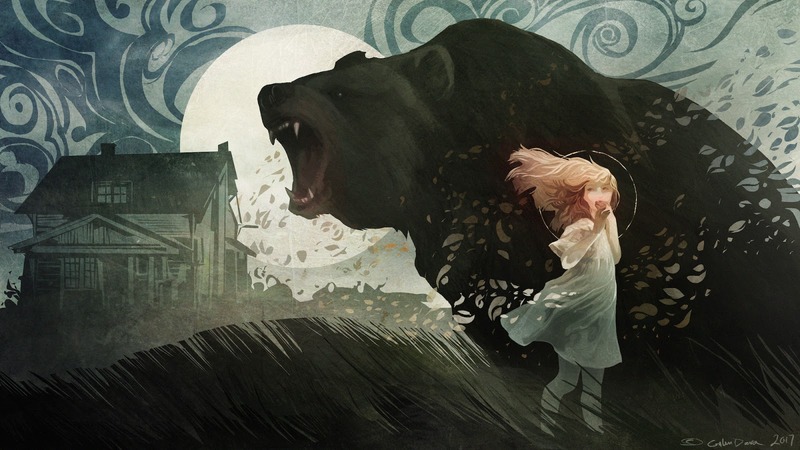 The story features Joanna and her brother Oliver and their father being sort-of trapped in the upstairs of their house after a bear wandered in through an open door. The backdrop to the piece is one of domestic instability—the children’s mother absent to see to a sick relative and unable to take the children with—and violence. The father is an alcoholic and not high functioning, descending very quickly into a spiral of abuse, paranoia, and self-pity. The story does an amazing job of contrasting the violence of the father with the peace of the bear, who happens to be named Susan. And most of the story’s speculative elements come from the fact that Joanna can speak with Susan, can not only understand bear language but can use it herself. The story takes aim at what is natural and what is unnatural, showing Susan as a loving parent and as a protector of Joanna and Oliver, who are so vulnerable and cannot wholly look after themselves, though they do show they are strong, that through their fear and their love for the father they also care about each other and their own safety. The story twists expectations, building this standoff where at first the bear is seen as invader, as wild, and yet the wildness was already inside the house, the danger already there, far worse than anything the bear could pose. Strangely, this story reminds me of the argument that people might need guns in schools to fend off bear attacks, because it reveals that the true danger, or at least the greatest danger, isn’t going to come from the outside, isn’t going to come from the natural world. Indeed, the most likely person to kill a child is their parent. The most likely person to kill a spouse is the other spouse. We like to build fear surrounding these Others, these bears, and yet statistically speaking the story places the greatest danger right where it needs to be, at the feet of an alcoholic father who is unfit to care for his children. It’s a beautiful and magical piece about safety and about protection and you should definitely give it a read! This is an amazing and creepy retelling of the Snow White story but with an even darker truth underpinning an already grim plot. The characters are all there, the daughter and the father and the stepmother (the little men as well, and magic and revenge and battles)—but everything is put through a new lens that makes perfect sense and deepens the imagery and associations of the original story. Part of what I love about fairy tale retellings is how they use the themes and imagery of the original to make something wholly new, and in this case both disturbing and fun. [SPOILERS] Okay, no one ever says vampires in the story but it certainly seems to be what’s going on here, and it’s a slow revelation and one that fits so well with the blood red and pale skin, the rulers and the humans that seem like cattle. Perhaps my favorite part of the story is the way that it subverts the ideas of rule that the original story was all about. Legitimacy of rule and the danger of women was something that Snow White always treated with but here it’s all twisted around this further wrinkle that the rulers of the realm are vampires and view the people, their subjects, as cattle. Given how most people were treated under this governing model, where the peasantry was bled by the nobility, used as sport and as servants and little else, it’s a great way to update and complicate the setting and make for some seriously creepiness in having the story unfold from Snow White’s point of view, who is far away from the pure and innocent version seen in the Disney movie. Instead she’s a complex character who is part monster, part hero, and entirely compelling. I love how the piece is framed, as well, the way that it draws the fairy tale and its more “innocent” overtones and declares baldly that it’s a piece of propaganda, that it erases the complexity of not only Snow White but her stepmother and the rest of the characters as well, making it palatable but diluded at the same time. And here is the full version and it is uncomfortable and an amazing read! This story takes a look at life following the recent presential election and what happens afterward for one many, Dennis, who just wants to avoid having to be around fascists. In his quest, he rediscovers hiking, and while out hiking, he meets a young girl named Emily who isn’t really what she seems. It’s a weird story that seems to go for a sense of humor in the face of what has happened but the humor is dark and for me a little conflicting. At least, given that it’s a flash fiction, there’s a lot here and quiet a bit to parse, but it’s also just rather charming in the way it sweeps in all these big concepts and lets them hanging like blades above Dennis’ head. [SPOILERS] And okay, part of my conflict is that I’m not sure how to feel that the story that is about a man fleeing having to be around fascists and running into an alien who asks him questions about global warming but also reveals that Earth is doomed on numerous fronts, not least of which because this alien’s people are going to keep humans alive solely to eat them. The core complication of the story is, as I see it, that Dennis is trying to bury his head in the sand about the implications of what has happened. Though he lightly condemns those drinking their pains away, he doesn’t really have anything to offer except maybe hiking? Which is no less ignoring the problem and hoping that it will go away. The story seems to imply that Dennis, while philosophically outraged about what has happened, is also rather checked out from it. He just wants to be, and yet this alien reminds him that there is no ignoring the problem. There are too many linked problems for that to work. Because while Dennis might be in no danger directly from the government, he sure as hell is in danger indirectly, though the worsening of climate change and the delay in doing anything that would ease the mass die-offs that will most likely happen. Dennis is confronted with the idea that humanity will be devoured by aliens and this strikes him a bit more but that the urgency is there for aliens and not climate change seems the whole point, that he (and we, I guess) shouldn’t lose sight of the dangers to the world while we’re fighting other dangers to the world. Or, I guess, that we need to fight because otherwise we’re all fucked and we might be anyway so...It’s an interesting story and one that I will probably have to spend more time with but it’s cute and it’s worth checking out to make your own mind up about. This story is a follow-up, or at least linked, to the novel Infomocracy, which I quite enjoyed and reviewed over at Nerds of a Feather. This piece follows Mishima through more of her life and particularly how she has lived with her narrative disorder, which prompts her to see stories in everything and leaves her very vulnerable to becoming addicted to stories at the expense of her other duties and possible experiences. More than in the book even the story does a fantastic job of exploring this part of her identity and mind. It really conveys the extent to which this disorder has shaped her life and her trajectory, has pushed her into chasing narrative while also creating a life’s path that lacks a lot of central structure. She moves seemingly at random from profession to profession, largely cut off from other people, and looking back it’s a life that doesn’t always make sense. Or, perhaps, that Mishima doesn’t want to make sense of. There is a definite double-edgedness to her condition, because while it allows her to see the world in these very interesting ways, and decipher a lot of things that people think are mysteries or hidden from her, it makes rather a mess out of her personal relationships and the trail of jobs behind her. It’s a situation where as long as she keeps herself distracted with what might be ahead she doesn’t have to examine her life behind, which I think the story does a great job with, revealing a woman who has spent a great deal of her life running away from the pain that her disorder causes and the ways that it is misunderstood. No one can solve or even really treat what’s happening with her and in the face of that powerlessness she flings herself into her work, which is quite dramatic and certainly keeps her from getting bored. If there was one thing that bothered me it was that she’s referred to as grown-up only when she is partnered and has a child, but even that could be attributed to the way her mind is trying to frame her life, like as long as she’s reached some new character arc she can avoid looking at what went before. It’s a fun story that delivers an added layer to the novel and gets readers ready for the sequel, though, and I for one am quite excited to see what happens next. Definitely a story to check out!